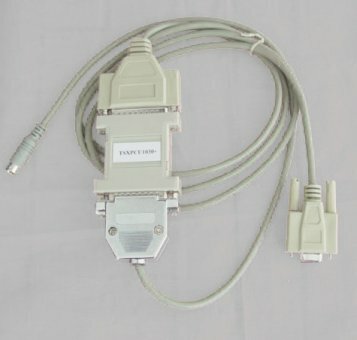 RS232/RS485 interface cable for Schneider PLC programming,3 meters,with master/slave switch,used for programming communication or other communication such as MODBUS. TSX08PRGCAB (also known as TSXPCX1031) is the programming cable which is provide connection and the RS485 signal converter through the RS232 serial interface. The power of the cable is from the TER port of the PLC. TSX08PRGCAB can be used for Modicon TSX Series PLC of Schneider and PC or other equipment which provide the traditional RS232 serial port communications. The cable can communicate with TER interface of TSX Premium (57), TSX Micro (37), TSX Nano (07), TSX Naza (08) Twido PLC, and to realize the procedures to upload, download, surveillance and other function such as multi-point communication of MODBUS. Since the AUX port of the PLC have no power output pins, TSX08PRGCAB can not use this port. The snap switch located on the TSX08PRGCAB programming cable are used to choose a different mode of operation. The cable rejected the way which the transceivers of the RS485 is controlled by the PLC, and all the data transceivers is automatic controlled. It can be used for multi-point and point-to-point communications applications. TER ports of the TSX Series PLC have a DPT signal pin, which is used to determine the work methods of the terminal TER. If the DPT for high-level, TER always work in the Uni-Telway Master (main station) mode, so the PLC programming in the corresponding way. If the DPT for low-level, the work methods of TER decide by the PLC. TSX08PRG connect with computer and communicate with Schneider PLC need to install Uni-Telway or MODBUS driver to at first, for using the corresponding various PLC programming software, to realize the operations as upload, download, control and communications. These drivers are usually included in the programming software on CD-ROM And for the specific installation steps, please refer to the instruction files on the CD-ROM drivers, and details are not necessarily listed here. Double-click on the icon, then achieve the settings, XWAY Test, MODBUS Test communications test of the RS232 serial (COM slogan) which is connected with TSX08PRGCAB cables. Then the programming software can be used to complete the normal communication with the PLC. The largest communications range between the TSX08PRGCAB and PLC are up to two kilometers (9600 bps),when external plus terminals an 120 ohm resistance and a 5 VDC power on the RS485 ports (8 pin Mini DIN Male) of the cable. And a FSACC01 Isolators Box (Schneider's model: TSXPACC01) is need to install at the end of PLC. 0.5 mm2 unshielded twisted pair lines are used for Communications. When the distance is over 2,000m, a RS485 repeaters (model: E485GP), can be installed in the bus for extending the distance for 2,000 meters.